I am honored to write this guest post on "apples" for the women who write "From Blah to Ta-Daa"! My name is Cristy and I have my own blog entitled "So Many Kids, So Much Fun". www.somanykidssomuchfun.blogspot.com. I am a stay-at-home mother of 4 (Lillian, age 11, Andersen age 8, Harrison and Malcolm age 6 who also happen to be identical twins!). I strive to see the positive in all situations, remain calm, have fun and then I blog about how well (or not) it's working for me! I plan to guest post again soon. Thank you again, ladies! Everyone has heard the saying, "An apple a day keeps the doctor away." While this notion has been around for a long time, it still holds true, somewhat. Nowadays, we use the Food Pyramid (http://www.foodpyramid.gov/) as a guide to promote and maintain wellness. The Pyramid states that you actually need 5 servings of fruit and vegetables per day. So, a modern version of the adage may be more along the lines of "An apple (or five) a day keeps the doctor away (plus don't forget your grains, proteins and dairy)"! Did you know that apples lower blood sugar? They have a lot of soluble fiber, which slows down the release of insulin into the bloodstream. They also have Vitamin C and potassium. If you don't peel your apples, you get the added benefit of Quercetin, a flavonoid contained in the skin. Foods rich in flavonoids have been known to lower the incidence of lung cancer in a Finnish study published in 1997! No doubt, they are healthy. 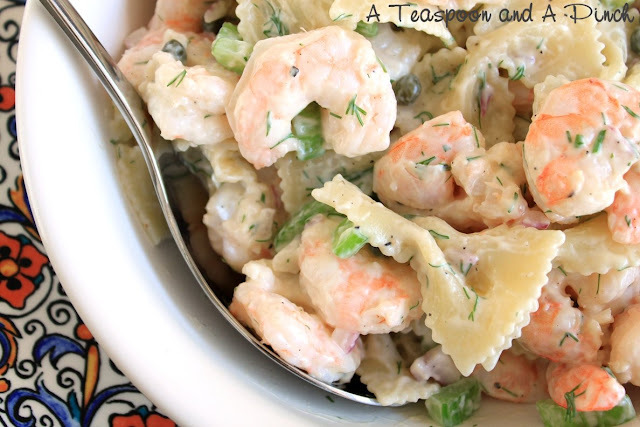 They are also versatile, convenient and delicious! Wash them and pack them in your kids' lunchboxes. Eat them straight off the tree, peel them and bake them into pies, press them into yummy cider and apple juice, bake them into a cake, make applesauce or apple crisp! The possibilities are endless. The varieties are also many. I live in Massachusetts, one of the many states where apples are grown locally. 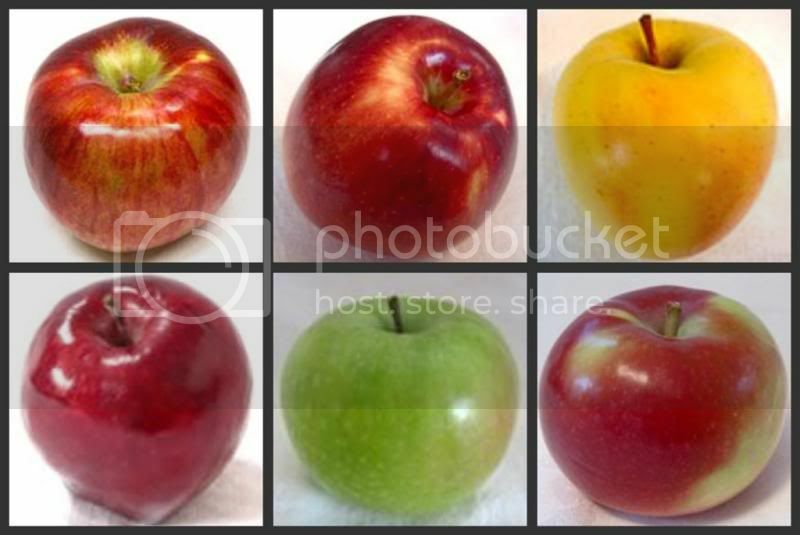 Some examples of typical kinds of apples that I see for sale in my grocery store (pictured above) are Cortland (my personal favorite, red with some yellow streaks, great for cooking and eating whole), Empire (a cross between a McIntosh but sweeter and a Red Delicious but more tart; wonderful after a meal or for use in recipes) and Golden Delicious (another "all-purpose" type of apple). Then there are Eastern Red Delicious (firm, sweet and best eaten fresh on its own, or deliciously sliced into a salad, for example), Granny Smith (green and tart, working beautifully for baking and eating raw) and McIntosh (red and green, does best when mixed with a firmer apple for pies, but is fine if used on its own for applesauce. Of course, it always tastes good as a snack too!). One of my most anticipated activities in the fall (other than first craving then consuming apples ice-cold out of the refrigerator or drinking cider glass after glass) is going apple-picking with my family! First, we choose a crisp, fall day with a bit of a nip in the air for our adventure. Then, we drive out to one of the fruit farms. We live in central Massachusetts, so we have our "pick" of places to go! We've been to many, but we have a few favorites of course, such as one nearby that offers a breathtaking view of a hill with all of New England's foliage colors abound. Upon arrival, we take a hayride out to the orchard and start picking! My husband took these pictures about three years ago. 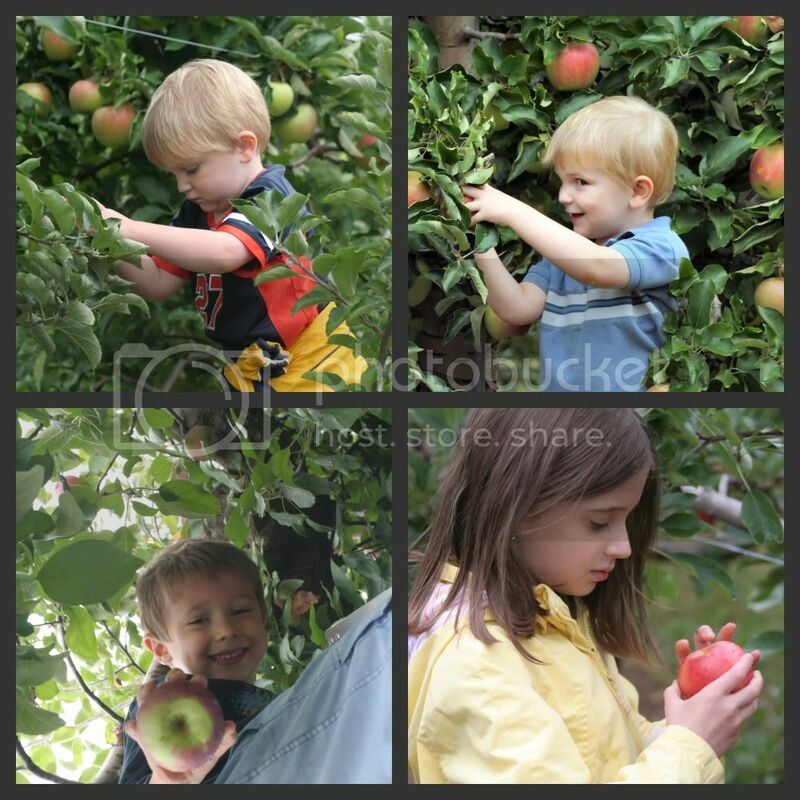 My kids have grown a lot since then, but this is the best set of apple-picking photos we have! We cherish them so much, we have copies framed in our kitchen, which, by the way, has an apple theme. Above: (left) Harry works hard to select the perfectly-sized apple. (right) Malcolm has a little fun! Below: (left) Andy spots the right one and climbs up a ladder to get it! (right) Lilly examines her fresh apple that she just hand-picked. (left) Apples in their natural habitat; (right) Malcolm and Harry tiredly leaving the orchard for the day. My children, who not only have picked apples with us on many occasions, have also gone on field trips with their schools! 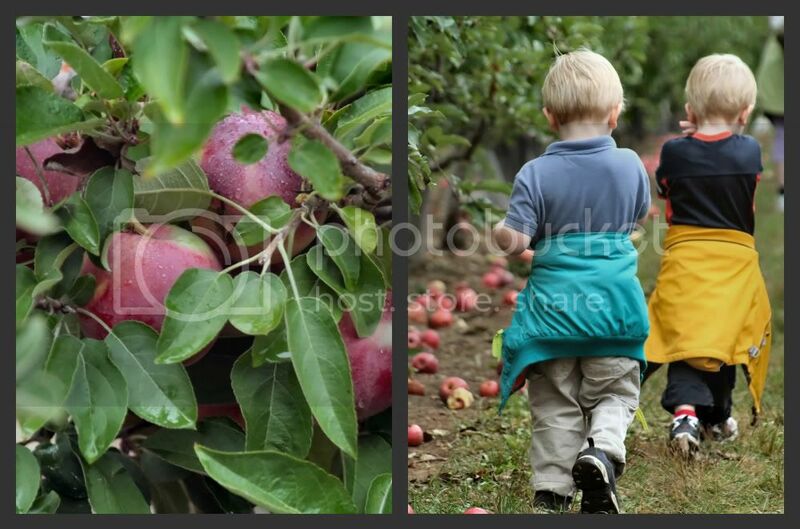 They are expert apple-pickers and have taught their parents well too! - Find a wonderful-looking apple on the tree. - Then, cup your hand underneath it and gently lift the apple. - Next, twist the apple so that the stem comes loose from the tree without damaging the tree's branch. - Do not select apples that have fallen on the ground. - When you get home from your day in the orchard, store your apples in the refrigerator to maintain orchard freshness! (left) Apple Crisp fresh out of the oven! 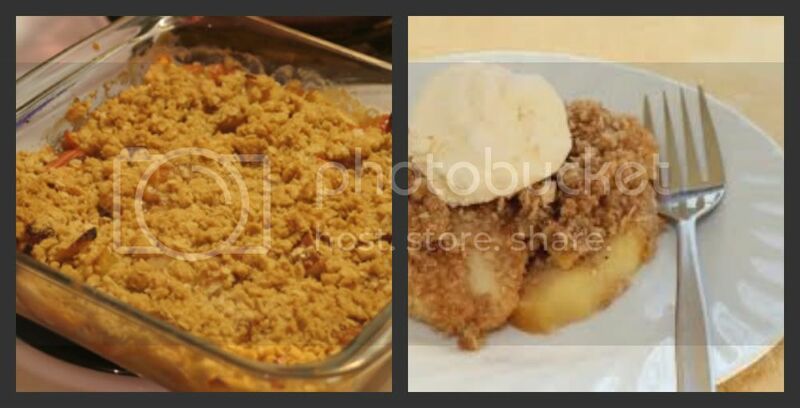 ; (right) Apple Crisp a la mode! Here is one recipe for apple crisp that I make. My kids can do a lot of it on their own now too. Serve it hot, with whipped cream or ice cream (or both!) and you'll be in apple heaven! 1. Heat the oven to 375 degrees Fahrenheit. Grease a 9-in square pan or baking dish. 2. With a knife, peel, core and thinly slice the apples. 3. Place the apple slices in a large mixing bowl. Add the lemon juice, raisins, flour and cinnamon. Stir until the apples are well coated. 4. Place the apple mixture in the greased square pan. Add the water or apple juice. 5. In another mixing bowl, stir together all the topping ingredients. 6. Press the topping evenly over the apple mixture. 7. Bake for 25 minutes or until the apples are soft. Pour a small container of cold whipping cream into a bowl. Beat with a whisk or electric mixer until soft peaks form. 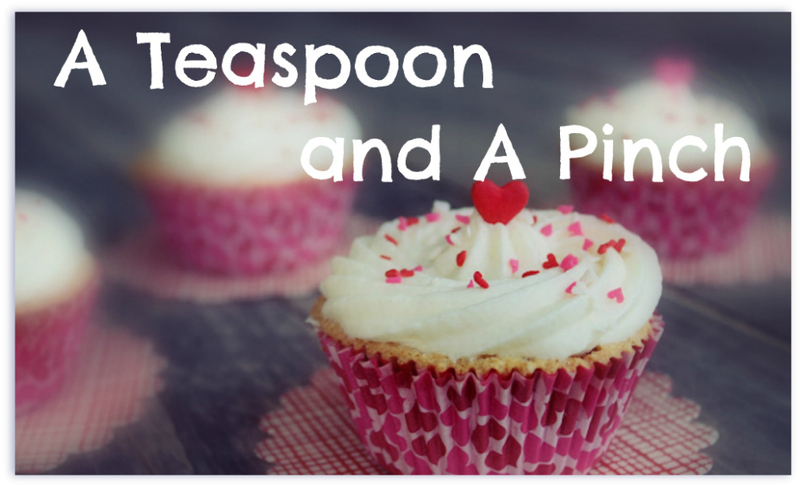 If you like, you can add 1 tsp sugar just as the cream starts to thicken.